Let’s get creative this year. With Christmas quickly approaching, gift giving instinctively jumps to the top of our To-do list. Well, let Gatherhaus give you five amazing gift ideas ranging from small to grand, inexpensive to lavish. And it all has to do with Vodka! Yes, that’s right my friends – Vodka! Check out how one bottle of Vodka can be the perfect gift. When you use Vodka as the inspiration, you can think outside the box. These simple gifts are homemade, which adds charm and sentimentality to your gift, without adding hours of prep and stress to your holiday. Homemade gifts communicate a special importance to the receiver in your life. 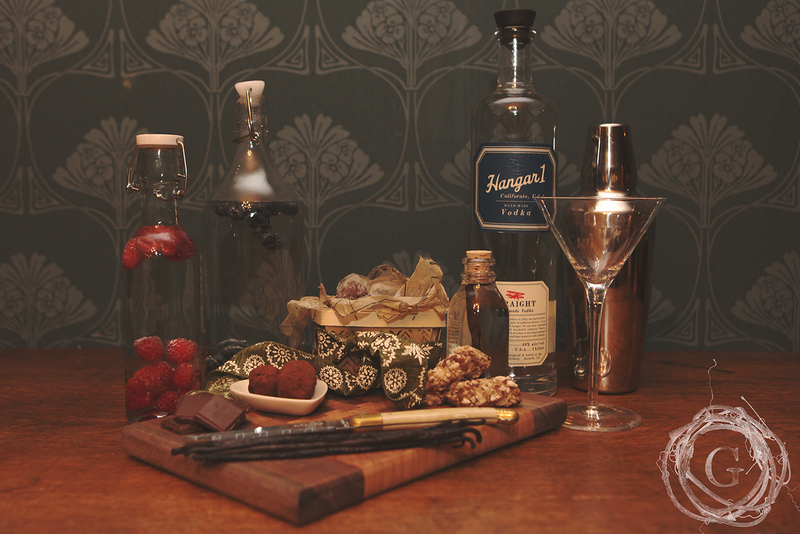 For this blog and for our own personal use, we love using Hangar 1 Vodka. It’s an amazing grown up, high quality Vodka. So let’s get inspired! It feels complicated but it’s amazing how simple this gift is, which allows you to appear as a homesteading genius. Perfect for: The people you don’t normally exchange gifts with: co-workers, book club friends, kids teachers, clients, extended family, or to keep on hand for when surprise visitors come and you need an impromptu gift. Supplies: I found perfect little bottles at Ax-man Surplus stores in Minneapolis and St. Paul. 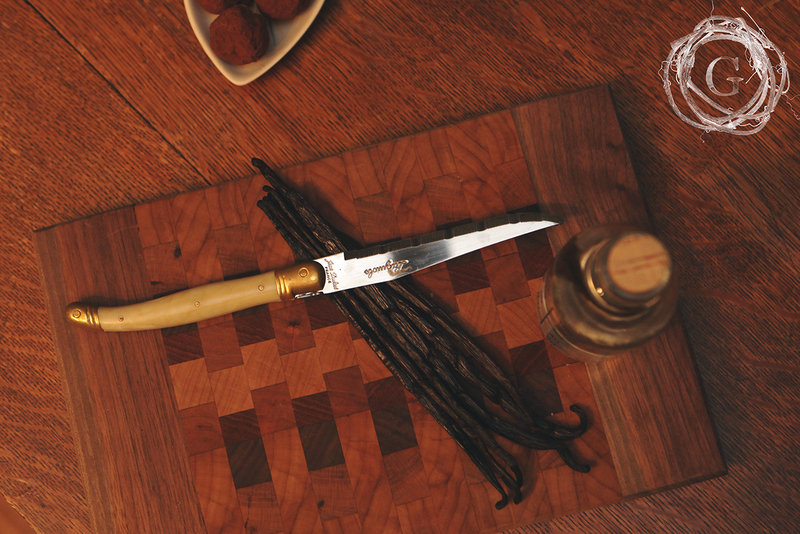 Vanilla beans can be really pricy, but here is our secret: get a 10-pack at your local Home Brew store! After hours of research, we found ours at Northern Brewer. http://www.beeradvocate.com/beer/profile/3034/?view=ratings. After all the online research, this is hands down, your least expensive option. And of course Vodka. Directions: Take a handful of small bottles, place in one vanilla bean that has been sliced down the middle and pour the vodka to the top. Shake or tip the bottle roughly once a week to assure all the vodka has been infused. The vanilla bean needs to soak for 3-6 months. Give this gift as is, or tie a ribbon around it to make it festive. This gift is thoughtful, prudent, and SO easy to do! If you have people who appreciate mixed cocktails and like to experiment, or you are attending a Holiday party and need a hostess gift, homemade infused Vodka is the perfect gift. It is unique and requires a small amount of time, but if you match the flavor with the personality of the person receiving the gift, it communicates that you have paid attention to their likes and dislikes. You can get very personalized with your flavors, think outside the box! If the recipient likes Bloody Mary’s what about bacon (use the fat, not the actual slices of bacon) and horseradish, a rosemary infused vodka would taste great with a grapefruit based cocktail, and berries are a classic choice. Perfect for: A hostess gift, that fun aunt who is always mixing drinks at family gatherings, your grandfather, college friends, or siblings. Supplies: We got our bottles at Ax-man Surplus. We suggest purchasing high quality fruit and berries at a local grocer. Again, you need a bottle of your favorite Vodka. Directions: The infusion takes a week, so plan ahead. 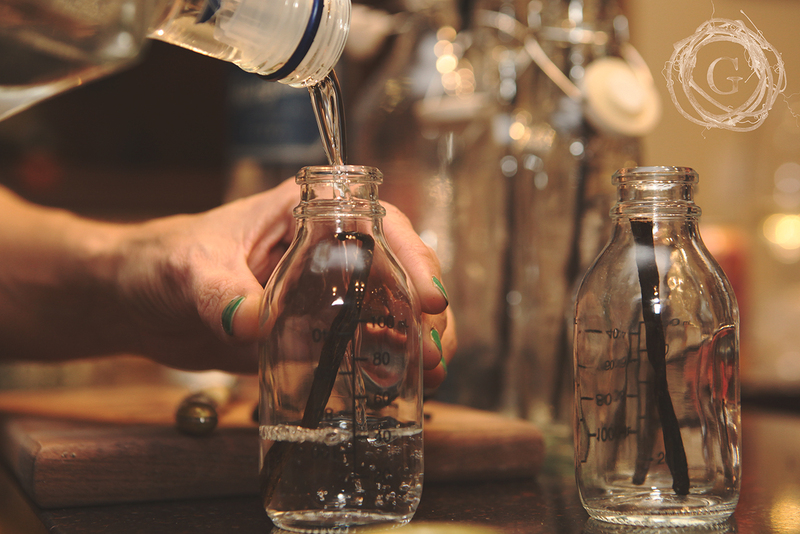 Make sure the ingredients you are putting into your vodka bottles are clean. About a handful of ingredients for a medium sized bottle works, but you can always add more to taste. Peppers need to have thin slices in them, peeled fruits need to have their peels removed and be sliced thinly, berries need to be squished slightly to release the juices, herbs need to be gently crushed. Place ingredients in an air tight bottle (we got ours at Ikea), fill with vodka, place bottle in a dark place and shake once a day. Test the taste of the vodka (yeah, tough job!) after 3 days to see how strong it it. Each ingredient will infuse at different speeds. 3 days to a week is plenty. Strain the ingredients out of the vodka and pour into a new pretty bottle and you are done! And as an extra bonus, you have vodka infused fruit to have a fun little snack after dinner…just keep away from the kids! This is a delightful gift and can be as stripped down or fancied up as you need it to be. There is wide variety here due to the fact that every person has their own way of making hot chocolate, so you have endless options. Grown up Hot Chocolate is often served with a little shot of spirits to add to the holiday feel. In this case, we use Peppermint infused vodka to add both a flavor and a splash of zing. Perfect for: Those friends in your life you share all the dirty secrets with, your sister in law and your mother, if she is into that sort of thing. Also a great idea to bring as a shared gift to a potluck or office Christmas party. 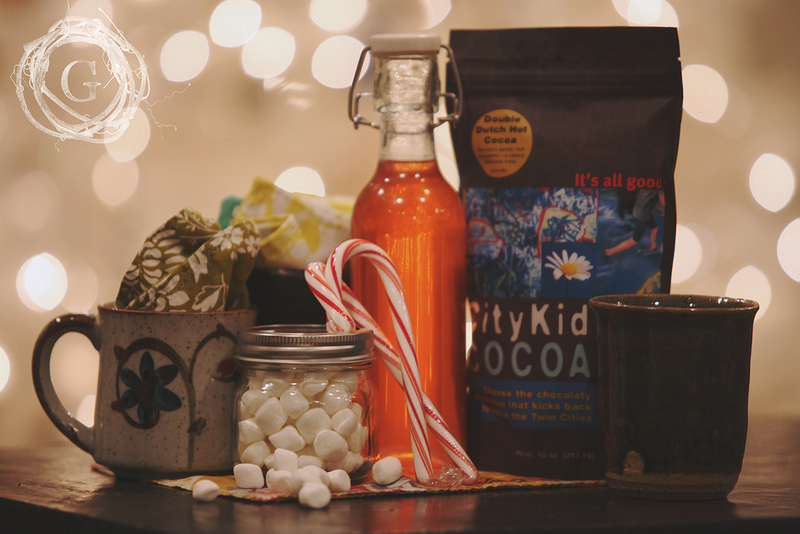 Supplies: The basics of your gift basket should include a basket or decorative box, one bottle of Peppermint infused vodka, a cute mug, a few candy canes that can serve as stirring sticks, and a good quality Hot Chocolate. Directions: Infuse your Vodka with crushed candy canes (see directions for infused vodka above). Find a cute basket or container and add in cloth napkins and mini marshmallows to sweeten the deal. Want to support a local artist? Purchase a couple hand crafted mugs. Want to go green? Hit the local thrift shop and pick out your favorite mugs and upcycle. Marie Porter, a local celebrity baker here in the Twin Cities created this gem of a treat. Marie has an amazing ability for finding unique and perfect paired flavors and turning them into mouthwatering recipes. This is a great vodka based gift to give! Visit her website to see all of her cookbooks, which also would make an amazing holiday gift! Perfect for: Anyone who has a sweet tooth and loves a little spirit in their Holiday parties. Directions: Here is how Marie does it straight from her website. Be sure to check out her blog! Her food is inventive and amazing, and she has recipes for the gluten free crowd as well! Please do not re-post this recipe without the permission of Marie, who created it. Slice vanilla beans lengthwise, scoop the seeds out. Add beans and seeds to the jar, top with vodka, and shake well. Store in a cool, dark place for about a week, shaking daily. After 1 week, taste. If the flavour is good and strong (it’ll likely be! ), strain out raisins and vanilla, discard. If you want more flavour, allow it to sit for another week or so, shaking daily. Truffles are a high end dessert, but don’t be fooled, they are quite easy to make. Splash a little Spirits (vodka) in them and you will take them to a whole new level. Box up a handful for a small gift, or fill a tin for a significant gift. Roll your Truffles in crushed pistachios for a festive color, powdered sugar, cocoa powder or pecans. Supplies: Fancy tin found at a thrift store, small gift box with all the fixings, 1 batch Truffles and tissue paper for wrapping. We chose thrifted patterns as our tissue, and love how it looks! In a large saucepan, bring the cream to a simmer. In a large bowl, combine the chopped chocolate with the butter and salt. Pour the hot cream over the chocolate. Let stand until the chocolate and butter are melted, about 5 minutes. Whisk the ganache until smooth and shiny. Divide the ganache into 4 bowls. To flavor it, add either the vodka, rum, peppermint oil, espresso or cardamom to each batch. Cover the ganache and refrigerate until firm, about 3 hours. Line 3 large rimmed baking sheets with parchment paper. Using a 1 tablespoon size ice cream scoop, drop level tablespoons of the ganache onto the baking sheets. Chill until firm, about 1 hour. Spoon the coatings into small bowls. 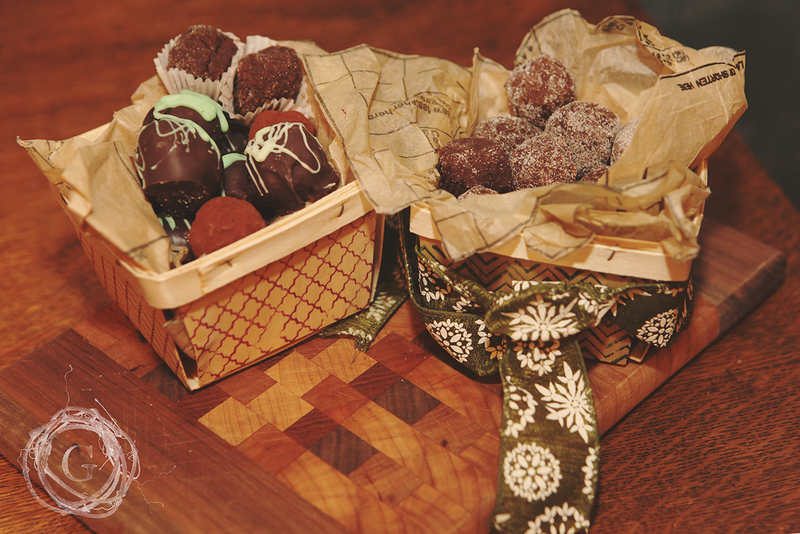 Moisten your hands with ice water and roll the ganache into balls, the roll in the coatings. Package the truffles in decorative bags or boxes. Friends, Vodka is the gift to give this year! Enjoy making one or all of these for all those fun people in your life. Be creative, find your muse, think outside the box, get vodka and give great gifts. Do you have a vodka inspired gift you want to share? We would love to hear from you!